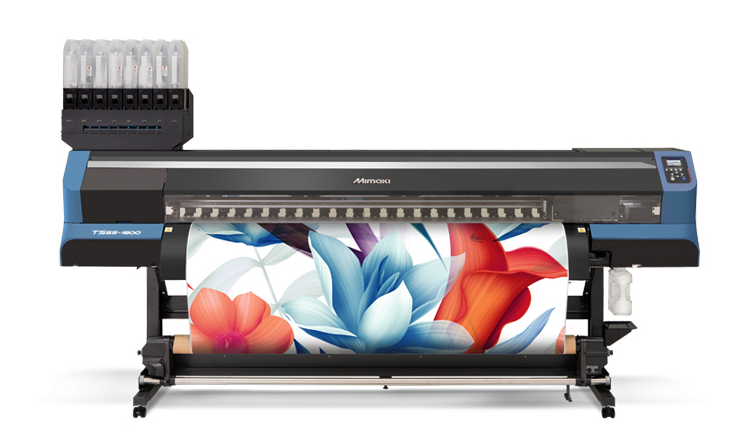 Mimaki USA, a global industry leader of wide-format inkjet printers and cutters, today announced the release of the new TS55-1800, a 76.3-inch, dye-sublimation transfer inkjet printer. The new model offers high-end features, such as low running costs, industry-leading productivity and unattended continuous printing. “With the release of the TS55-1800, Mimaki has made exceptional digital textile printing features available to both the mid-level and high-end markets. Now, customers are able to effortlessly scale their operation with a cost-effective sublimation printer that meets the high quality and short turnaround demands of the ever-evolving textile and apparel industry” said Ryosuke Nakayama, textile & apparel product manager at Mimaki USA. The TS55-1800 prints with the new Sb610 inks at a maximum output of 1,506 sqft/h (140 sqm/h). These inks hold the coveted ECO PASSPORT by OEKO-TEX® certification, meeting specific requirements with regard to sustainability, safety and compliance. Additionally, two new optional units, a mini jumbo roll and 10 kg ink supply, were introduced on TS55-1800. The mini jumbo roll is a feeding unit to load the 64-inch Mimaki Vision Jet-X transfer paper, supplied by Neenah Coldenhove, with a length of about 8,202 feet. This unit is an ideal way to ensure high-volume, unattended printing for longer production runs. It also decreases the running paper costs per square foot in comparison to the normal plotter rolls. The ink supply unit holds a 10 kg ink tank of a single color. The larger quantity tank allows for a continuous operation. Compared to the conventional two liter ink pack, it significantly reduces the ink unit price per quantity. The TS55-1800 is equipped with several of Mimaki’s Core Technologies to deliver an exceptional printing experience. The Mimaki Advanced Pass System (MAPS) provides greater productivity and print quality by eliminating visible banding. The Nozzle Check Unit (NCU) automatically monitors the performance of the printhead and detects clogged nozzles. The Nozzle Recovery System (NRS) allows the operator to substitute unproductive nozzles to avoid poor image quality or service calls. Together, the NCU and NRS enable uninterrupted printing even if nozzle errors do occur. Those interested in the TS55-1800 are encouraged to visit www.mimakiusa.com/TS55 for more information.